I got my Kindle for my birthday and started loading up the odd book here and there. Today I have 40 books on it, and have read 1, although I've started a couple of others using the Kindle. I'm going to say straight out - although I can see the usefulness of the Kindle (and it is WAAAY lighter than hoofing around three or four books whenever I travel away from home), I have not fallen in love with the reading experience, and, if given the choice, start reading traditional print books over my Kindle any day. One feature of the Kindle I adore is the case I lovingly purchased - it has an inbuilt light which runs off of the Kindle power supply. It means I can read the Kindle at any point without disturbing other people by needing lights on. It is also great being able to carry around so many books at one time. I am a definite mood reader, and I find that I need a few novels to choose from whenever I finish my current read. The Kindle is perfect for this - like I say, I have 40 books which range through sci fi, crime, fantasy, chick lit, and YA. Every situation is covered. I also like the fact that I can accept ebooks from self-published authors. I realised while doing the Angry Robot slush reading that there are a LOT of talented authors out there who do not have traditional representation via agents and publishers - and these are the people who need extra help when it comes to marketing. Since having the Kindle, I have accepted a number of self-published novels and aim to read and review them. Also, I am a naughty person and read while I eat on the majority of occasions, and not having to hold pages open is just ACE. 1) I like the weight of a book in my hand. I like the tactile element and the turning of actual pages. 2) I like a page count. I DETEST the % value completed shown on the Kindle - it makes it all mathematical and clinical, and I become utterly obsessed with completing the book and keep eyeing the % value and it disturbs my reading rhythm.... ARGH! 3) I can't take my Kindle in the bath - unless I'm, y'know, stupid! And I do a great deal of reading in the bath. It's my favourite place to read, because I'm warm, comfortable and relaxed and absolutely no one can disturb me. Also, I can't take Twitter in the bath, which is a horrendous distraction from reading, so I get way more done. 4) I can't look at all the books I own on the Kindle. I can see them in a list, sure, but I like to see the covers and the spines. I love my bookcases - the colours and the names and the different thicknesses of the books on display! They look simply gorgeous and allow me to see in a moment what I could read next. I've resorted to writing a paper list of all my Kindle books to remind me of what has now slipped to page 3 and 4 on the home menu. 5) I have a nasty habit of skimming words on a computer screen - the instant nature of blog posts and online articles etc mean that I no longer read with absolute attention when a screen is offered. Hence I find myself skimming Kindle books way too fast and having to go back over and over to pick up all the details. If anyone has any suggestions for how to turn this like to love, I'd really appreciate them! I've tried reading a very familiar book already, but that didn't work. All suggestions gratefully received. And I'd love to hear about your Kindle reading experiences. I found it very easy to use and get used to but then again I love techy gadgets and am a bit of a geek so maybe it just is second nature to me. Don't give up on it though. I like the Kindle and dislike the Kindle for pretty much the same reasons you listed. The one other problem I had with it is when reviewing a book (that I have forgotten to take notes on) I have trouble finding the information I need on the Kindle, as you can't just flip through it like a book. What I do love is a) being able to carrying lots of books around with me at once b) the fact that it can do audio books as well as print books and c) the fact that it has internet. I'm also currently trying to get a book published and I have to admit that putting my book on my Kindle felt pretty awesome, even if it isn’t actually published yet. ;) I was also able to send a few copies to my friends to beta read it on their Kindles, which is much more user friendly than having to beta read on the computer. Interesting post, and I agree pretty much with all of it. Having been turned on to ebooks in a big way, six months later I'm now turning a spare room into a proper library (ie, paper books!) and buying more paper than ever before. I think the Kindle (or any other device), like ebooks themselves, shouldn't be viewed as a replacement for paper. Maybe that's where the problem lies. You mention that the Kindle is handy for reading the Angry Robot slush pile, for instance. In my case, I do a fair amount of travelling, and being able to load my iPad with books for the journey is infinitely better than trying to cart 2-3 books in my hand luggage. So they have a place... but yeah, I'm thinking they're not going to replace paper anytime soon. But they don't have to. Hmmm, I have a lot of similar complaints, but my most major agreement is the % thing. I also hate not knowing what page I am on. That said, I also agree that eBooks aren't going to take over for a long while. I use my Kindle for books I'd not bother with physically (so like little MMP's that I don't think I need to be in my future custom library) and find that reading them on there is great. I still buy physical books, often, and I think that I will continue to do so, but I DO find that wanting to read a physical book is a draw that I've yet to be able to shake like a drug addiction...and I doubt it will go away. I'm happy to ride the line between eBooks and real books. Agree with everything you and the other commentors have said here. Got mine for my birthday too. I would say another reason that books win... I dropped my kindle the other day. On concrete. It bounced... and bounced... and bounced. Now much as I would hate dropping a book and maybe bumping the spine or scuffing the cover, I would not have had a near heart attack like I did the other day. I would not have felt like I was in some slow mo horror movie as I sloooowly lunged forward trying to catch the damn thing, falling to my knees and sobbing desperately... OK there was no sobbing but there was fear. BIG fear. How do I tell my dad that his uber expensive and extravagent pressie is broke already?? It's not. It's fine, a bit scratched on the edge but fine. So yes - books bounce and scuff. 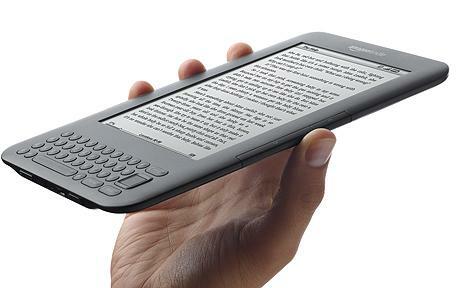 Kindles bounce and potentially break. I don't see how the page number thing isn't just as mathematical as a percentage figure. It's just different is all, it's still numbers. Just something you're not used to. I really don't get that complaint. As for not being able to take it into the bath. You just need to get creative. I've seen people mention using ziplock polythene bags for their kindles to waterproof them. How many times have you dropped your books into the bath? Is that any more likely to happen with a kindle? On the off chance it happens you can try some waterproofing measures. I personally don't take my books anywhere near food or water. They MUST be pristine, which usually also means I'm doing all sorts of acrobatics just to minimize spine creasing. This is one area where the kindle is advantageous for me. No spine creasing! It means when I get into a comfortable position for reading in bed (where I do most of my reading) I can stay in that position without having to fidget. I don't think the ereaders will necessarily replace paper books yet because I think there's always going to be people who want the paper versions. However, the tech is still in its infancy, there's still room for improvement in the devices themselves not to mention on the publisher side of things. There's going to be improvements and additions made to the devices (maybe solar-powered ereaders? that sort of thing) which will alleviate some of the problems, but I'm happy to stick with my kindle3 for now. Just like I don't like my spines to be creased on paper books so I tailor my reading around that. The same will go for the e-reader devices at the moment. I'll tailor my reading around some of the foibles. I still mix both e and paper versions but I am definitely reading more and more on the kindle. I would love an eReader for any number of reasons, including text search and the ability to hold my entire library in one hand. However, I could never give up my physical library, and your #4 is probably my main reason: I'm a very visual person, and I love to just stand and stare at my bookshelves. I also like pulling a previously-read book off the shelf on a whim and flipping through it; you can't do that on a reader—or at least not in the same fashion. And while I don't need the tactile sensation of, or to keep count of, actual pages, I like to be able to flip back to a previous section while I'm reading (pretty much a given while reading Gene Wolfe) and even if I don't know the exact words I'm looking for, my visual leanings can tell me left-hand or right-hand page, and which part of the page the passage I'm looking for is on. Again, not possible with an eReader. My Kindle's been a godsend for me this past week, since my bandaged hand makes it very hard for me to hold a proper book open and turn pages easily. Kindle's lightweight and pages get turned with a twitch of my thumb. It also makes it far easier to get through the books I get from NetGalley, since my only other option for those is reading them on my computer, which is a pain in the behind. I still love actual books more, but the Kindle sure is a handy thing. I had a similar problem with my kindle not being as physically satisfying and solved it with a cover from http://www.oberondesign.com/Kindle.php It may not have the fancy built in light but it makes your kindle look like a book you would be proud to have on a shelf. I LOVE the way it feels. It took me a while to get used to reading on the kindle and I had to kind of wean myself into it. I'll still buy hardback of books I love and want to display but I'm doing away with paperbacks one new series at a time. I found that creating folders and organizing my kindle books helps me keep on top of my reading. I also just put books on my wishlist instead of instantly buying since I can look at my wishlist from my kindle. Then when I finish a book I can download several samples of books I want to read, try them out then purchase the one I plan on finishing. The one thing I hate is not being able to loan books out. Also I reccomend just a ziploc bag for the bath (or the beach) you can put a papertowel in the bag if you are worried it might steam up. Works perfectly! One of the most frustrating aspects of using a Kindle is the difficulty in jumping to different points in a book. E.G. you're reading a fantasy book and want to check the map, or the index or a scene a few pages back. With a physical book this is a very quick process...with a Kindle...its just aggravating. Even when you can navigate to specific areas, there are too many button presses. 1) I live in a very small space and even after getting rid of many boxes of books (the trauma!) my bookshelves are overflowing and every spare place is filled with more boxes of books (and mapped and inventoried so I have half a clue where everything might be) - so being able to overindulge in bookbuying without inciting an avalanche and getting buried is a big plus. 2) I am, by nature, a lazy mare. So I can now pick up a book without having to shift boxes to find the one I fancy reading. And when I fancy a new book I can get it instantly with no worries about being in when the postie deigns to visit. And there's also the portability factor - I tend to read books quickly so when going away I've usually read through my weight-rationed books by the first day. Having a small & light Kindle full of excess reading matter is awesome. For preference, I'd read all fiction and a lot of the simpler non-fiction (ie. biographies & similar) on the Kindle. Though for the more academic tomes I'll stick with paper for ease of flicking and pretty pictures. I like my Kindle a lot, but paper books do have real advantages. I find the experience of standing before a bookshelf superior to looking at a dry list of titles. I can give away a paper book when I am done with it, I can't legally do that with an e-book. The lack of a secondary market makes the effective price of e-books higher: rather than buying some books new and some books used, I have to pay the new price for all books. There are of course advantages to e-books as well. There are so many free e-books: public domain books or books where the author has decided not to charge. I can get a copy of A Christmas Carol for free on the Kindle, but even if I went to a used bookstore, it would still be $2.00 or so on paper, probably about $8 or so if I bought a new copy. So, an e-reader can save a lot of money. E-books can also be much more readable. I have some old classic paper books, but the paper is yellowed and the font is tiny. On the e-reader, it's easy to read, because the background is crisp and clear, and I can adjust the font size. You also can easily try indy authors, their works can be on your Kindle in a minute or two. I'm still getting quite a few print books to review, but it's taking me longer and longer to finish reading them - after 200 pages or so I start to wilt. And for books I'm reviewing Kindle versions are so much simpler. I can add (and extract) notes, search the text, look up words I don't know, all seamlessly. With print books I need to keep a notebook and dictionary handy, and inevitably spend a good deal of time looking for that particular page where someone did something that I've now realised will be useful for my review.